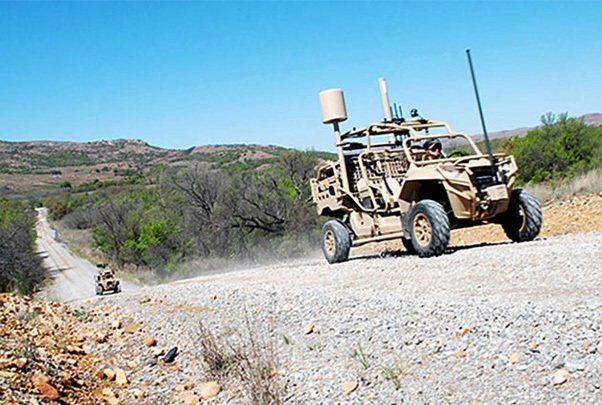 The Hunter (right) and Killer vehicles drive up a road toward the experimentation area of the Maneuver Fires Integrated Experiment (MFIX), April 3, at 2017, Fort Sill, Okla.
One such new platform, called “Hunter” and “Killer,” is undergoing testing during the 2017 Maneuver Fires Integrated Experiment (MFIX) from April 3 to 13, here at Fort Sill. The vehicles resemble a dune buggy — a large-wheeled vehicle designed for various types of terrain. But the Hunter and Killer are also designed to track aircraft, perform three-dimensional fires targeting and provide other capabilities. For forward observers, Soldiers who advance to the enemy’s edge and sometimes beyond, technological advances mean new risks and new responsibilities. In addition to their primary duties of gathering intelligence and relaying it back, they may now be called upon to perform precision fires. 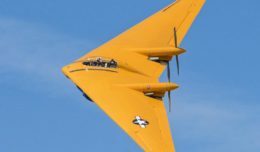 With the increasing use of unmanned aerial vehicles, they may be asked to intercept UAVs on the battlefield. With all these challenges in mind, the designers of the Hunter and Killer are experimenting during MFIX 2017 with the platform’s ability to operate with minimal human instruction. During MFIX 2017, Patton said, the users and testers of the platform are contractors, but there are plans to put a product in Soldiers’ hands by 2018. “This is just the first stage of the experiment and it’s also the first stage of the counter-UAV,” Patton said. “We also want to give the Soldier options based on [rules of engagement].